With their emphasis on supervillainy, comic books are the perfect genre for satirizing politicians who appear dastardly on a good day and demonic on a bad one. Warren Ellis’ Vertigo series Transmetropolitan features The Smiler, a smarmy presidential candidate who makes Eliot Spitzer look like a kids’ cartoon. In the DC Universe, Superman’s nemesis and all-around bad guy Lex Luthor became President a few reboots ago. Current Image Comic Citizen Jack is about a presidential candidate who literally sells his soul to the devil. 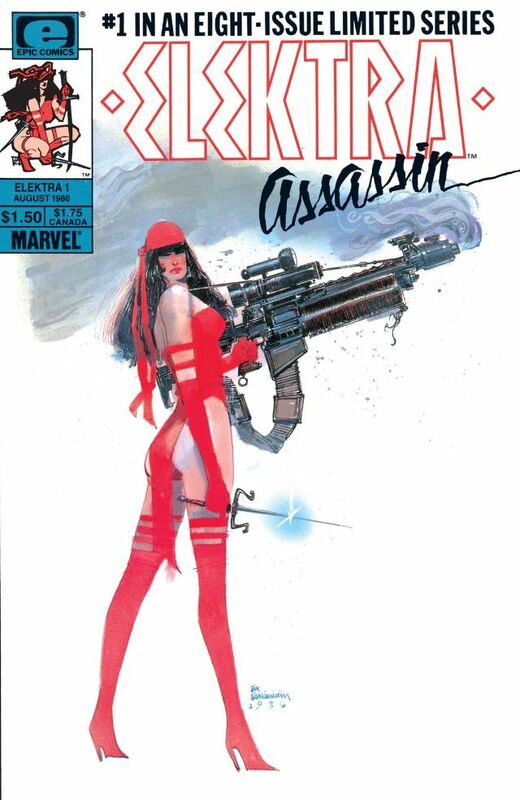 But the oft-forgotten classic Elektra: Assassin, written by Frank Miller and illustrated by Bill Sienkiewicz, tackles a similar premise with biting satire and inspired execution. Before you check out the titular Greek ninja in Daredevil Season Two on Netflix this Friday, do yourself a favor and read, or revisit, a story that was both ahead of its time and timeless. In this 8-issue series, Elektra has a simple, relatable mission: take down an objectively evil presidential candidate who smells like rotten mayonnaise. That candidate—who looks a bit like Dan Quayle but is actually a self-portrait by Sienkiewicz—is Ken Wind. Wind’s slogan, “Not wind like a watch but wind…like the air,” would be creepy enough, but Wind is possessed by the Beast, an ancient evil Elektra knows well from her former membership in the Hand, Marvel’s resident evil ninja clan. Along the way, Elektra escapes from an asylum, telepathically mind-switches with several characters, escapes from S.H.I.E.L.D. and uses ninja mind tricks to enlist the help of Garrett, a sleazy S.H.I.E.L.D. agent who becomes more robot than dude. 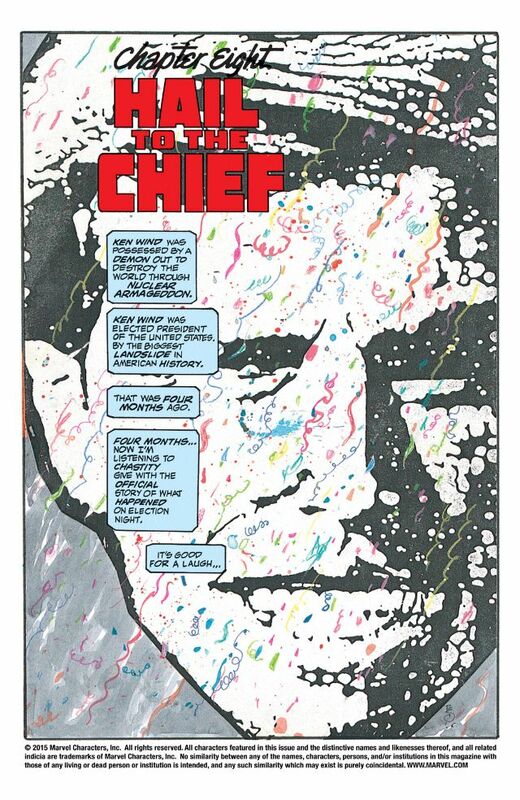 I can’t overstate how much fun Miller and Sienkiewicz are having in this series. They’re two virtuoso talents at the peak of their powers, making satiric hay out of politics, government, the military, gender stereotypes and other comic books, which were (and still generally are) weak sauce compared to this. A great example of the overflowing creative energy is the scene-setting news excerpts featured on the inside of each gorgeous Sienkiewicz cover (all of which would look equally at home in a dorm room or art gallery). For example, in the second issue, we learn that the freaky asylum Elektra escapes from is called the Valley of Peace Institution for the Criminally Insane. These articles also feature the only mentions of Soviet Envoy Vladimir Jackoff (possibly a relation of Archer’s Nikolai Jackoff) and Ken Wind’s campaign manager, Henry Swizzle. These little comedic touches show Miller maximizing the comic format and his own fun; they also reinforce that this is a satire above all—and one that couldn’t be much sharper or darker. The art is as stunning in 2016 as it was in 1986. Sienkiewicz started his career as a brazen Neal Adams imitator, but came into his own in 1984 when he took over the art in New Mutants, merging his previous style with the haphazard chaos of frequent Hunter Thompson collaborator Ralph Steadman and a kinetic exuberance. 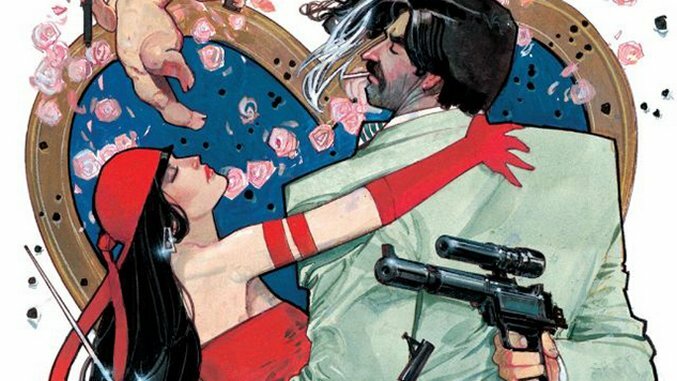 Elektra: Assassin is probably his masterpiece: the watercolored art is simultaneously seductive and repugnant, much like his first collaboration with Miller, Daredevil: Love and War. Sienkiewicz’s work is especially impressive when portraying the baffled, horny, angry plight of Garrett, who is boggled by Elektra’s physical and mental manipulations. Like Steadman, Sienkiewicz has a talent for grotesqueries that reveal character, and his art is as agile as, well, a ninja assassin. He moves from photorealism to surrealism within the same page, sometimes the same panel, all to serve the story while giving the reader a maximum visual feast. That’s a helluva creative way to show, but not show, Elektra chopping off Garrett’s hand, soon to be followed by his other appendages. By letting Garrett narrate the event in the dark (literally and figuratively) the reader experiences his shock and revulsion, too. 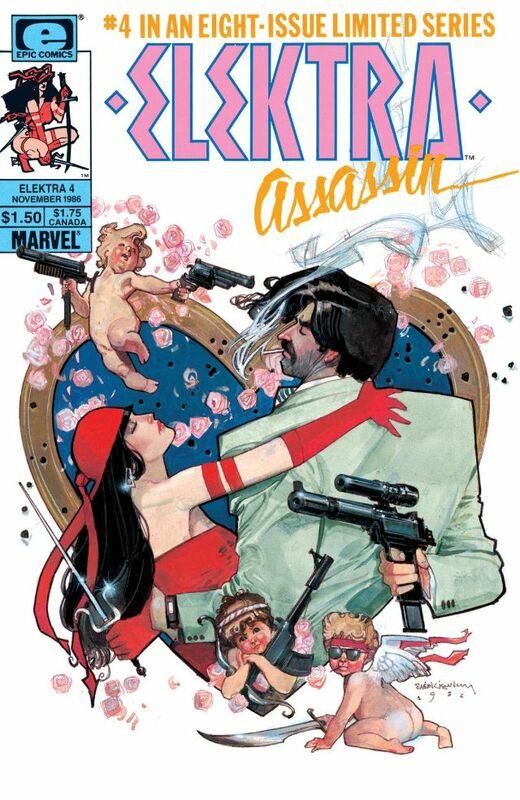 In fact, this dismemberment is pretty much the meet cute for Elektra and Garrett; one of this series’ many satirical targets is the romantic comedy. Garrett starts the series as a caricature of misogynist, hard-boiled, thinking-with-his-gun government goons, but he proves far less malicious than the government that employs him and reads his brain implants. Elektra, in blowing up Garrett’s body (literally) and getting into his mind (also literally), helps him become a better man fighting for a better cause. As the bizarre plot thickens, you can’t help but root for this cyborg maniac and ninja assassin to kill the incoming president and live happily ever after (while killing lots of other people, presumably). Elektra: Assassin was ahead of its time in many ways. Today, comics companies are finally embracing female fans and giving the spotlight to female heroes—but back in 1986, there weren’t many female-centric series, and Elektra was merely Matt Murdock’s ninja ex-girlfriend. This series changed that, giving her the spotlight in a major way. Elektra was also no mere bland hero, but a trained assassin. Anti-hero mania had just begun to hit comics and popular culture, but here was a murderous protagonist far removed from the simplistic morality of the spandex crowd. The sheer inventiveness and downright weirdness of this maxi-series were also uncommon in the 1980s: this feels more like a current Image comic than something from the days of Ronald Reagan and notoriously conservative former Marvel Editor-in-Chief Jim Shooter. The Dark Knight Returns and Watchmen came out in 1986 too, so it’s no wonder Elektra: Assassin gets lost in the shuffle when classic comic lists are compiled. But given the biting political satire from Frank Miller, and Bill Sienkiewicz’s uniquely expressionistic art, it’s arguable that Elektra: Assassin is the most currently relevant of the three. It’s also practical—we could avoid a lot of problems if all presidential candidates had to pass a Rotten Mayo Smell Test.